The Z7 marks the start of a new chapter for Nikon. It and its sibling, the Z6, inaugurate the second mirrorless system from the brand, the first with a 35mm format sensor and a large Z mount that Nikon has designed to prepare its cameras for the next generation of full-frame lenses. The Z7 is also Nikon’s answer to the Sony A7R mark III. They share many characteristics including a similar sensor resolution, 5-axis stabilisation, hybrid autofocus, 4K video, as well as numerous other things. 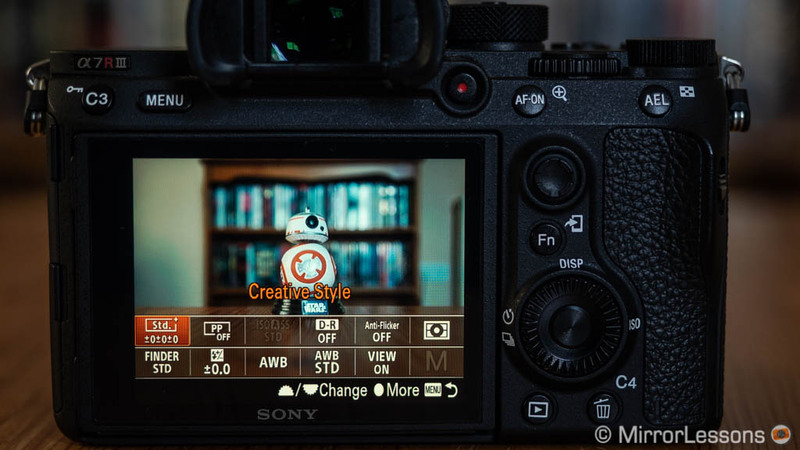 While Nikon is at the beginning of its new mirrorless path, the A7R III represents the most mature product in a series that continues to grow in popularity. A third-generation model, it has set a new benchmark when it comes to image quality and technology that is hard to match. We couldn’t resist pitting these two products against each another to see how strong a competitor the Z7 is for the Sony. After two months of testing, we have a pretty good idea of how they compare. Keep reading to find out more! 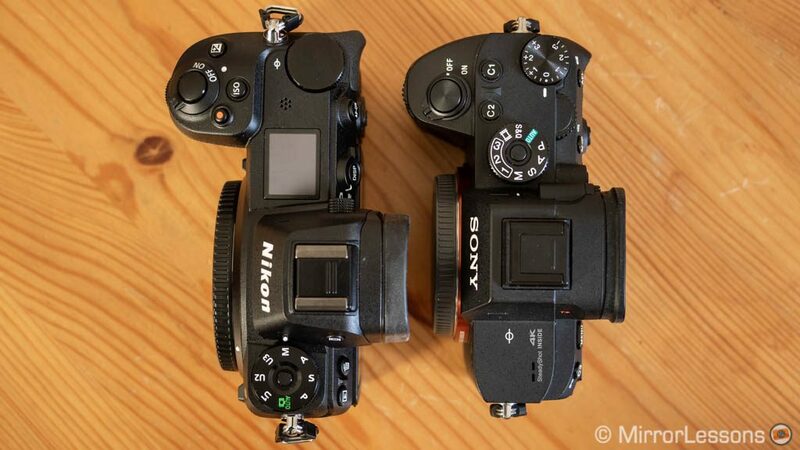 Ethics statement: We purchased the Z7 and A7R III to conduct our tests. We were not asked to write anything about these products, nor were we provided any other compensation of any kind. Within the article, there are affiliate links. If you buy something after clicking one of these links, we will receive a small commission. To know more about our ethics, you can visit our full disclosure page. Thank you! 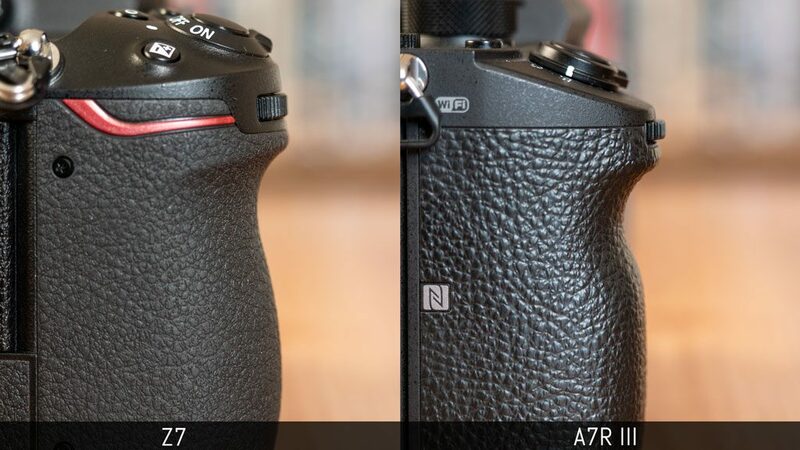 The Nikon Z7 and Sony A7R III are fairly similar in terms of design, but there are some key details that make a relevant difference to comfort and ergonomics. 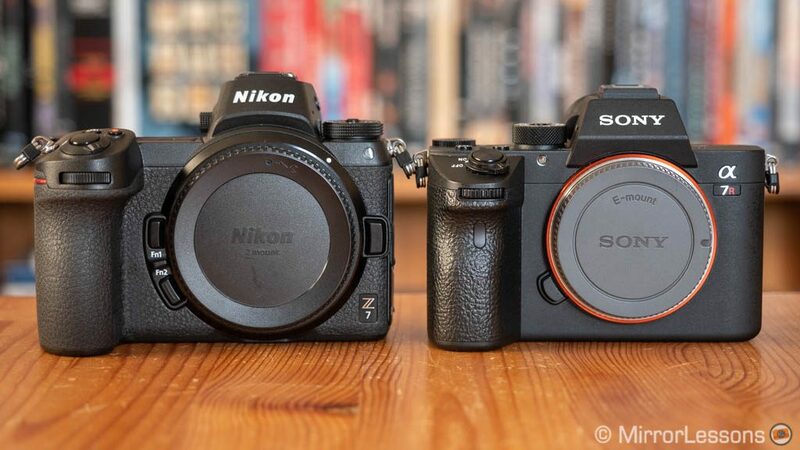 The Z7 is slightly larger and heavier than the Sony E-mount model, but if we look at both from the top and exclude the front grip, the Nikon is actually thinner than the Sony. Precise dimensions aside, I wouldn’t say that one feels much bigger than the other when used out in the field. 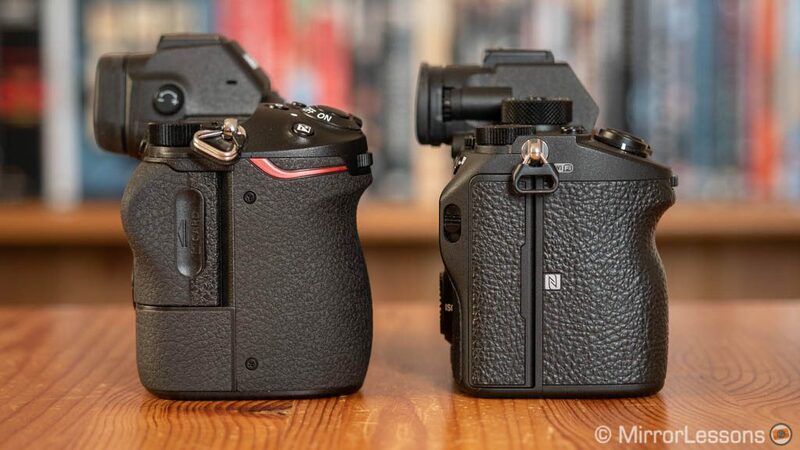 One important difference is the front grip: the Nikon version is taller and sits a little higher than the top plate. As a result you can rest all your fingers more comfortably. 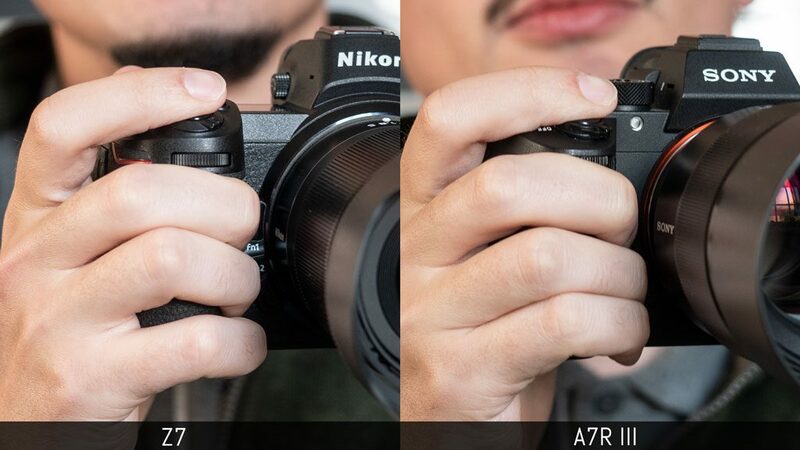 On the A7R III your middle finger can slide down more easily so you need to squeeze tighter to get a good grip. 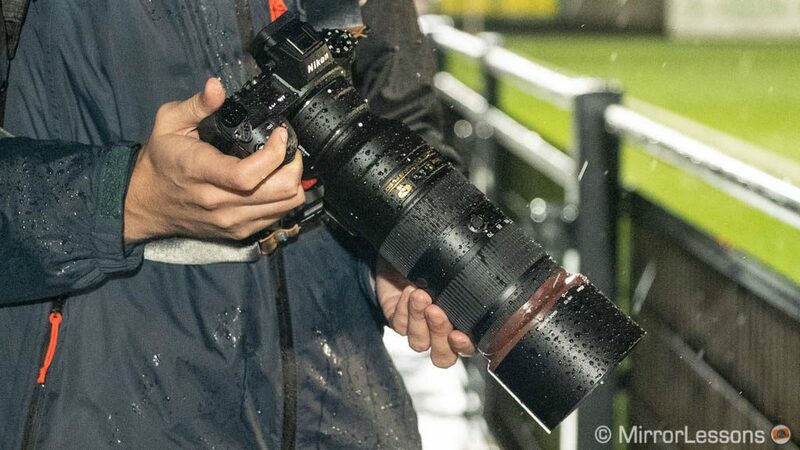 Also many Sony lenses near the base have a wider circumference than the mount, and this reduces the space for your fingers between the grip and the lens. Furthermore, the concave design of the Sony grip (where your middle finger rest) is deeper, so the camera can become more uncomfortable to hold when working with large and heavy lenses over a long period of time. This is because much of the weight rests solely on your middle finger. 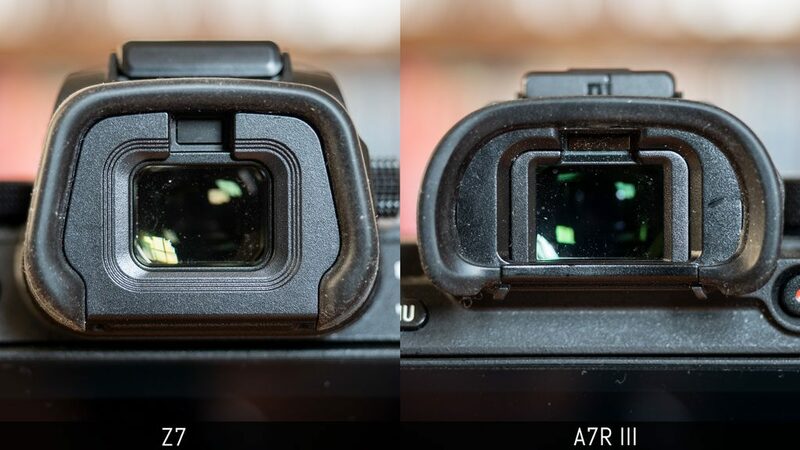 So overall the Z7 has a better grip, but I wouldn’t say it is the best of all mirrorless cameras I’ve tested: with large lenses I still miss a little bit of extra height and bulkiness. That being said, Nikon has dealt with the compromise between comfort and compactness very well. For the Sony, an optional grip extender can certainly improve the ergonomics (see our A7 series accessory list to find out more). Both cameras are weather-sealed against moisture and dust. I used the Z7 for 90 minutes at a football game in a heavy downpour and the camera stood up to these conditions really well. I can’t say I have had the same extreme experience with the Sony, but I’ve used it in the wet before and never had a problem. Now I am not enough of a geek to put my cameras through extreme tests other than what I experience in the real world, nor I do I have the knowledge to tear them down and assess how good the build quality is. Thankfully in the wonderful world that is the internet, there are colleagues who do this very kind of thing very well. 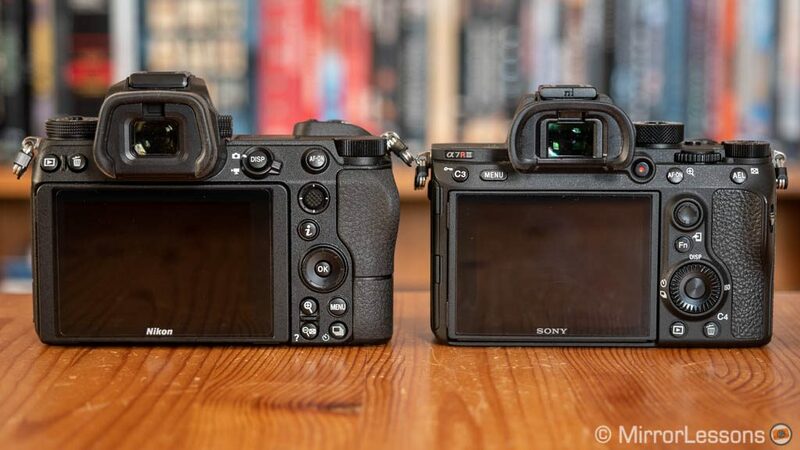 If you read the weather-sealing test at Imaging Resource, or the teardown article at Lensrentals, both websites point out some weaknesses of the Sony camera, whereas the Nikon seems to have the best build quality of any full-frame mirrorless product according to Roger Cicala. Continuing in the build quality vein, both cameras feature good buttons and dials that feel robust and precise, but I have a personal preference for the buttons on the Z7: they are a bit larger and softer to press, giving you better tactile feedback. 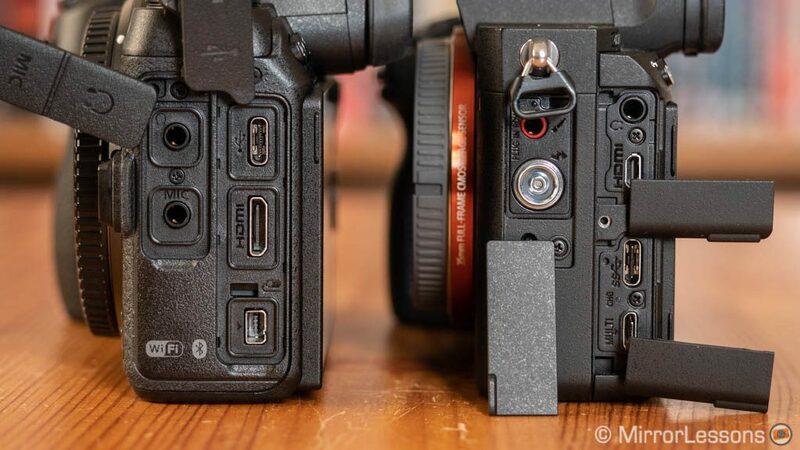 If I nitpick further, I could add that the covers for the physical connections and battery compartment feel more solid on the Nikon camera. 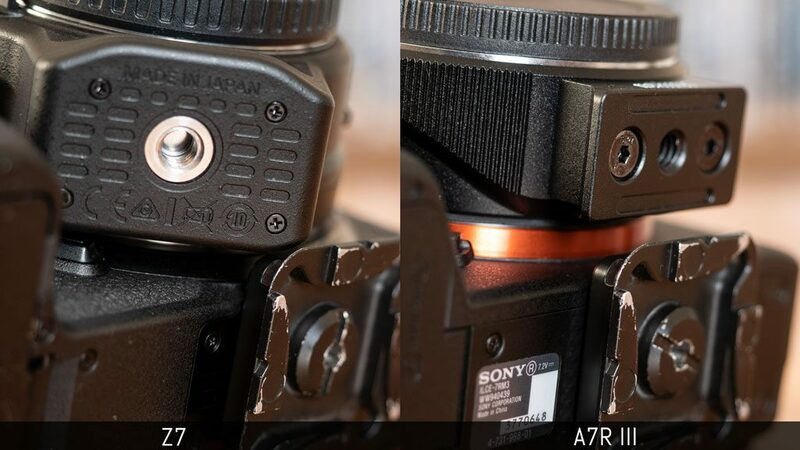 Looking at the mount, the Sony is held in place by six screws rather than four on the Z7. There is one thing that I find annoying on the Z model: the tripod socket is too close to the edge of the bottom plate. Because the mount is larger the Sony’s, even a small arca swiss plate can interfere with the FTZ mount adapter. This becomes quite annoying if you frequently change between native and DSLR lenses and require the use of a tripod with both. The Sony has an additional USB 2.0/Multi-terminal port which means you can use two USB accessories at the same time: for example a power bank and an intervalometer for long sessions of time-lapse shooting. The Sony also has a Flash Sync port, whereas the Z7 has a proprietary accessory terminal meant for use with Nikon’s remote control and other products. Finally, we have the memory card slots. The single slot choice on the Z7 has generated a lot of disappointment considering the price of the camera and the fact that nowadays, many high-end mirrorless products have adopted the dual slot solution. 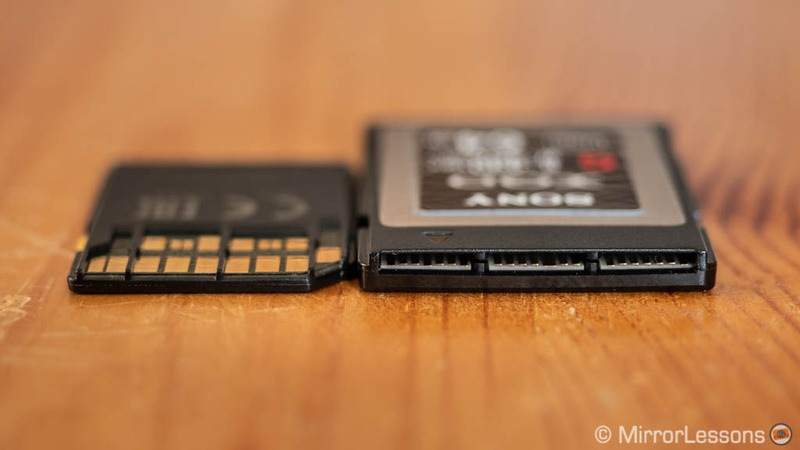 The technical explanation for this is that Nikon decided to use the faster, more robust XQD card, which is thicker than the SD card used on the A7R III and thus takes up more space. 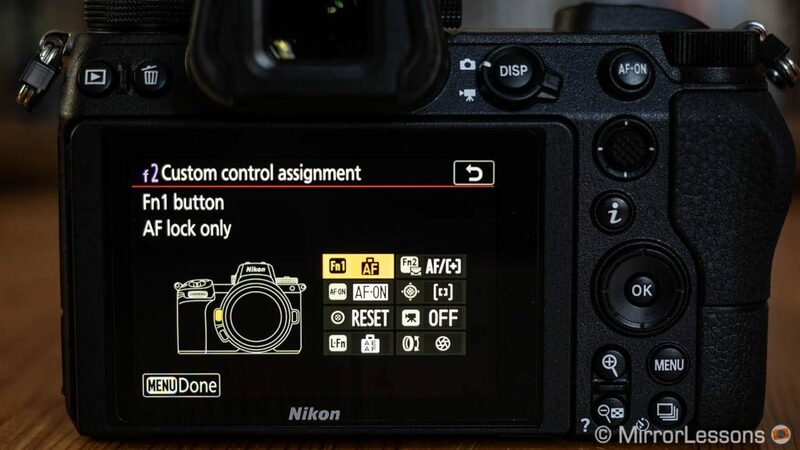 A future firmware update will make the Nikon camera compatible with the CFexpress standard. 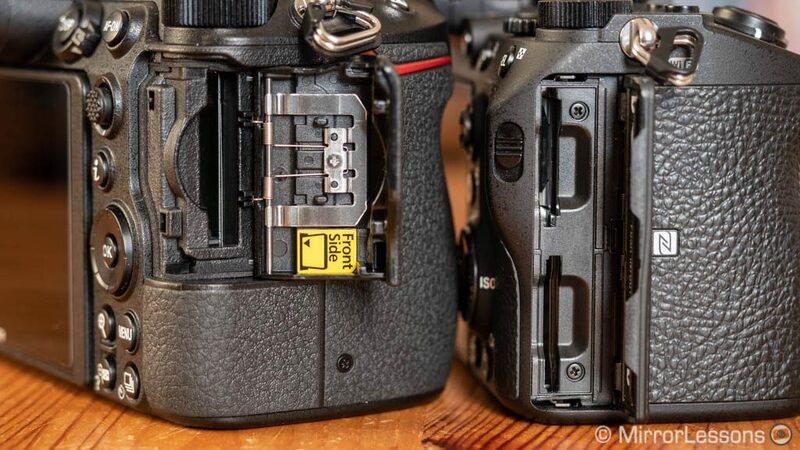 A single slot can be a deal breaker for photographers who rely on two cards for their work or want some peace of mind. I too would have preferred to see a dual solution on the Z7. I’ve used many cameras with a single slot (even for work in the past) and almost never had a problem, but I do remember one SD card failing while recording a video with the Olympus Pen F, and when that happened I was very annoyed: I lost some very nice footage that I could only partially re-record. I have no complaints about my Sony XQD 64GB card so far, and I do admit that its thicker design gives a sense of superior robustness. 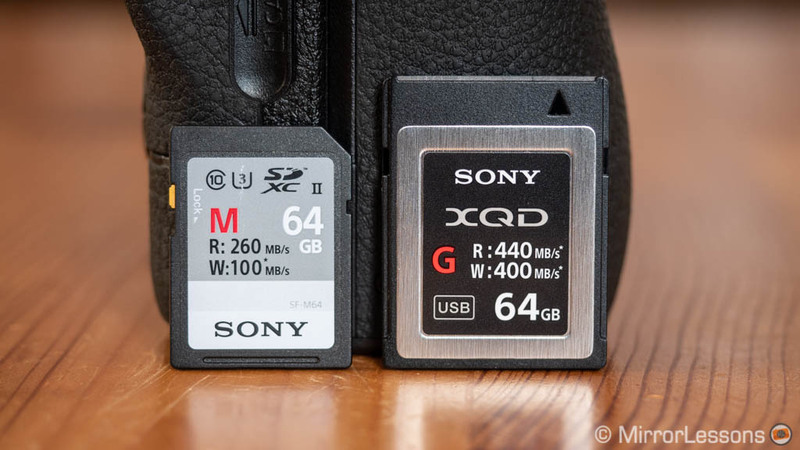 But it is also true that SD cards have come a long way and are very reliable these days. Sony even released a weather sealed “tough” series. Anyway, as you might have already guessed, the A7R III has two SD card slots with the first one being UHS-II compatible. 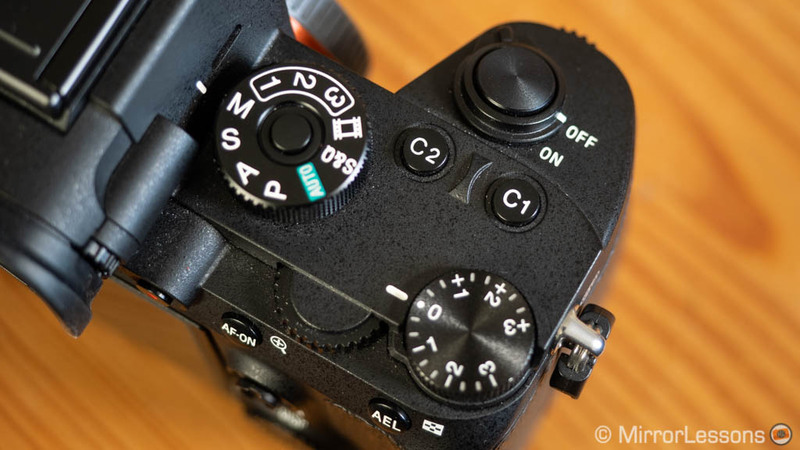 There is a traditional shooting mode dial on both cameras with an unlock button at the centre that must be pressed and held to rotate the dial. On the Z7 it is positioned on the left-hand side to make space for other things on the right side of the top plate, including an OLED screen that we’ll describe later on. 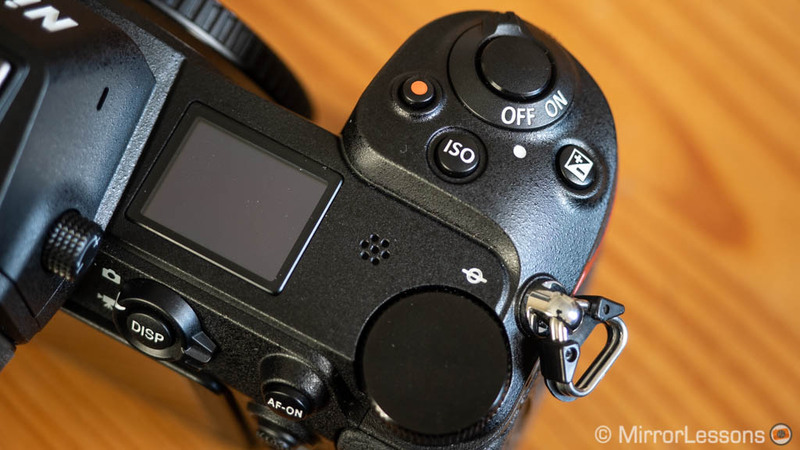 The On/Off switch is larger on the Nikon, and its shutter release button is more sensitive. 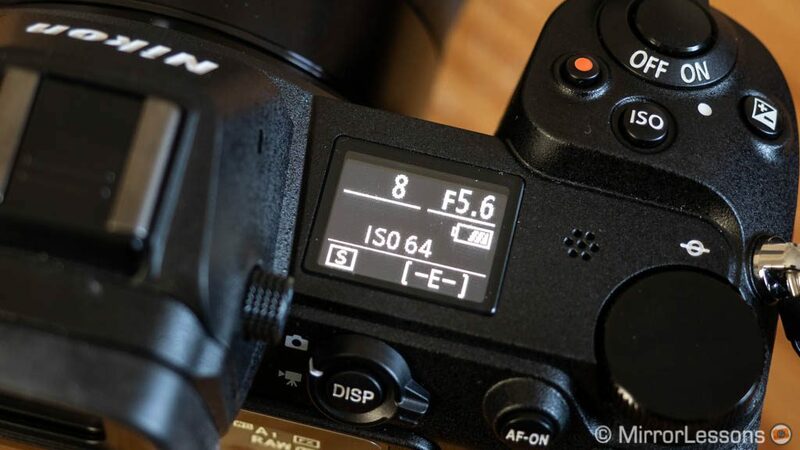 Next to it you’ll find dedicated buttons for ISO, exposure compensation (±5Ev) and movie recording. On the E-mount model, the movie recording button is located near the EVF on the rear. 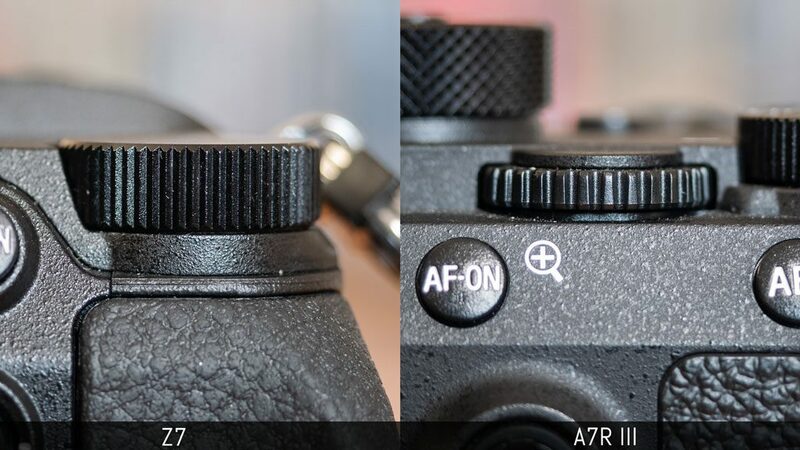 The A7R III has two custom buttons and an exposure compensation dial that works at ±3Ev. You can bypass the dial and work at ±5Ev by assigning the function to a custom button. 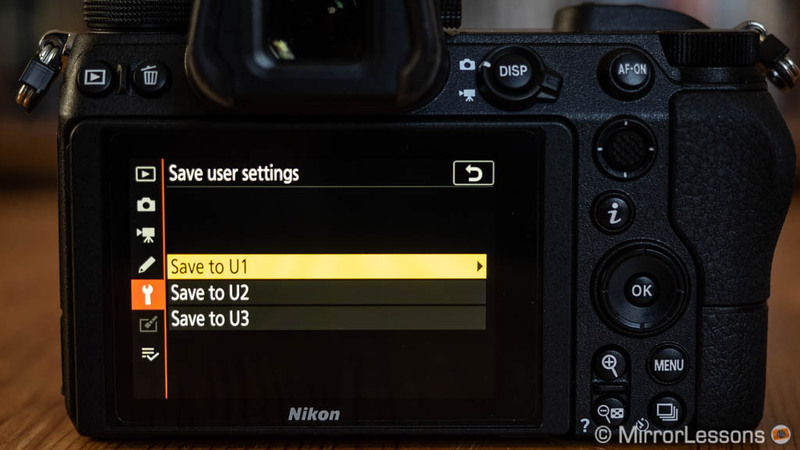 Exposure compensation can be used in manual mode with Auto ISO on both cameras. Each model has two command dials that control aperture and shutter speed. 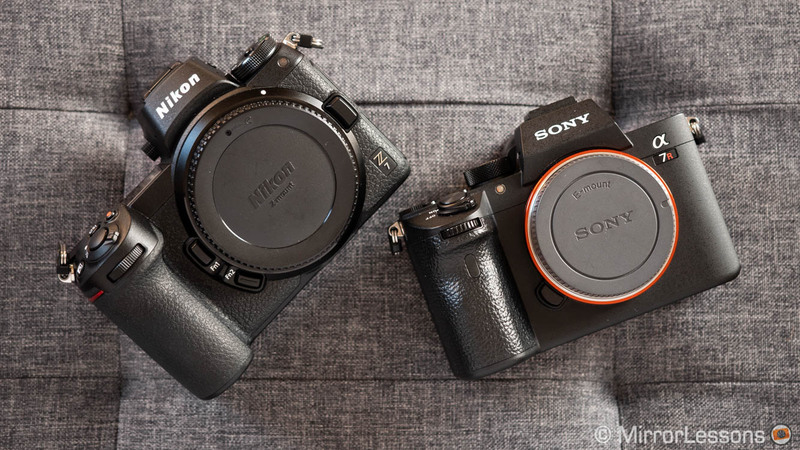 The one on the front grip is nice to use on both, whereas the one on the rear is definitely smaller on the A7R III, and a bit more difficult to grab onto than the large dial of the Z7. The two command dials can be used to change other settings in conjunction with different buttons (ISO, AF mode, etc). 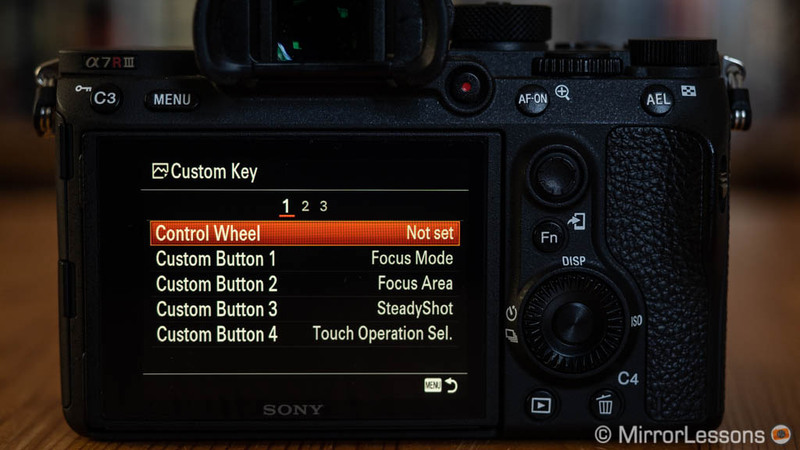 On the A7R III, you can use the control wheel for the same purpose. On the rear you’ll find various buttons that give you access the menu/quick menu and let you play back your pictures for example. They each have an AF Joystick which is reactive and precise in operation. The concave design of the Sony’s makes it a little more comfortable but the one on the Nikon is nice to use as well. 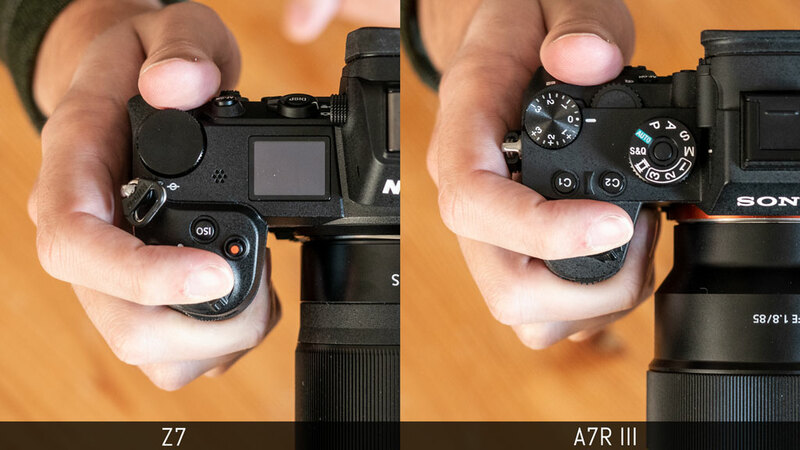 The 4-way controller can also be rotated on the Sony, whereas the one on the Nikon works in 4-directions and can’t be personalised (unlike the A7R model): it can be used to move the AF point or navigate the menu. 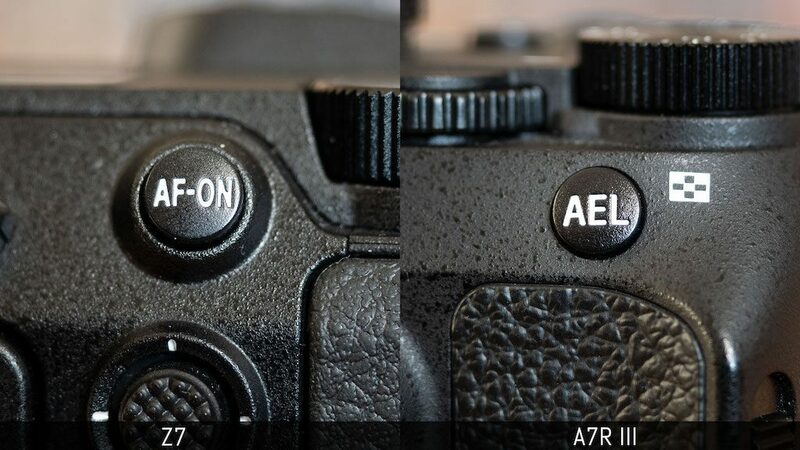 Speaking of personalisation, the Z7 has 7 function buttons whereas the A7R III offers a total of 11 customisable buttons, plus the rotation of the control wheel to which you can also assign a specific setting. 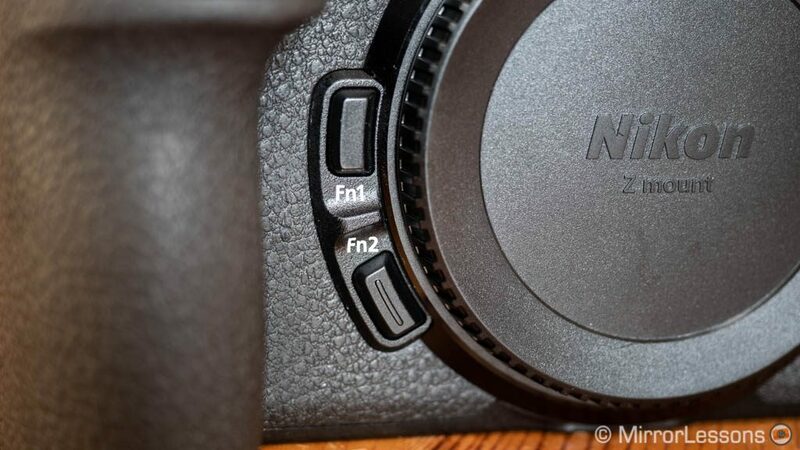 The Z7 has two handy Fn buttons on the front near the mount that are easy to reach, and those are the ones with the largest number of settings you can choose from (36 options in total). Others such as the AF-ON or OK buttons are more limited. The A7R III gives you much more freedom as each C button can be configured with a choice of 82 settings. 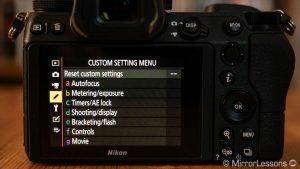 Both cameras offer the possibility to configure these buttons, as well as other settings, separately for video which is very useful if you often switch back and forth between still and movie modes. 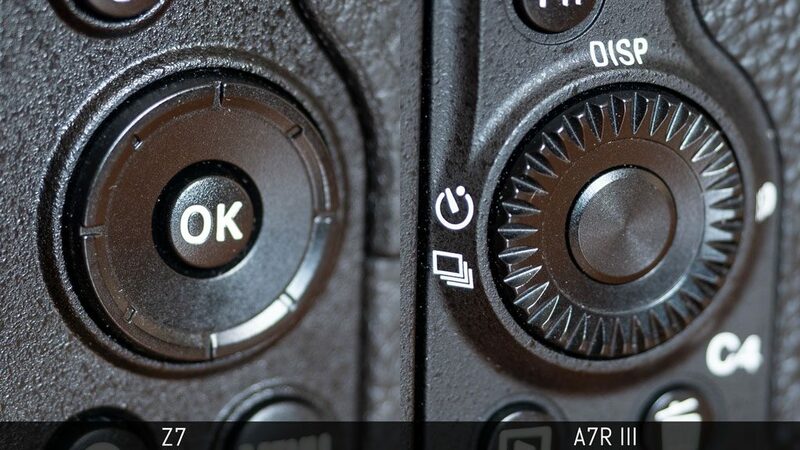 The Z7 allows you to lock shutter speed and aperture, whereas the A7R III can lock the AF joystick, dials, control wheel or all of them. You can configure buttons located on select lenses from both brands. 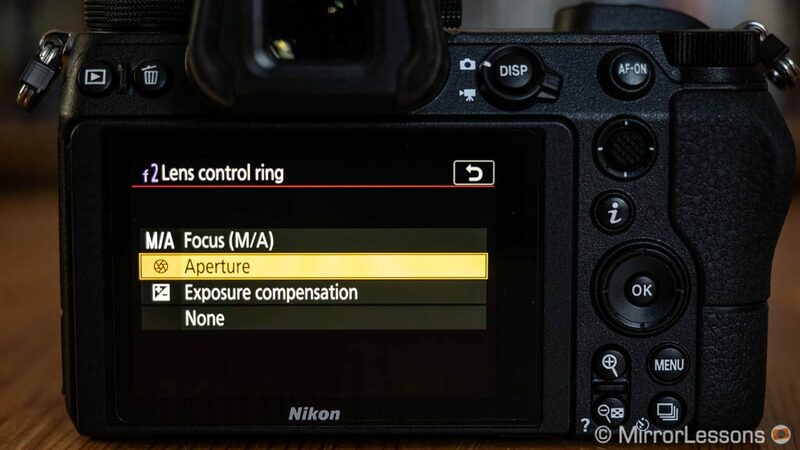 For the Z7 there is also the Z lens control ring: it can be used for focus, aperture or exposure compensation (note that it reverts to focus when you switch to MF mode). It is smooth and pleasant to turn on the two lenses I’ve used (Z 24-70mm f4 and Z 35mm f1.8) but in the end I didn’t bother configuring it for something else other than focus. It would have been more interesting if this control ring were an addition to the traditional focus and zoom rings, rather than a replacement. It would also have been nice to have the option to “click” it when using it for aperture changes in still mode. So overall the Z7 offers less customisation than the A7R III but it is also more well configured by default and I felt less of a need to change things. It is intuitive and the learning curve isn’t as bad as with the Sony. 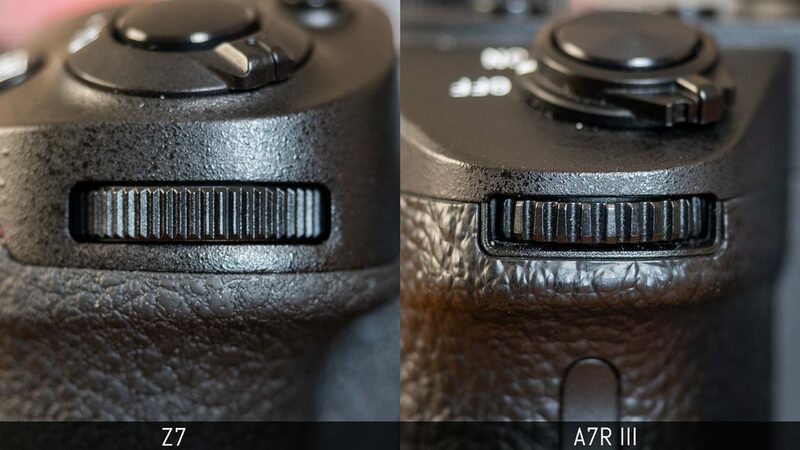 That being said, by offering more customisation, the A7R III can become more user-friendly if you dedicate the time to learning how to use it well. 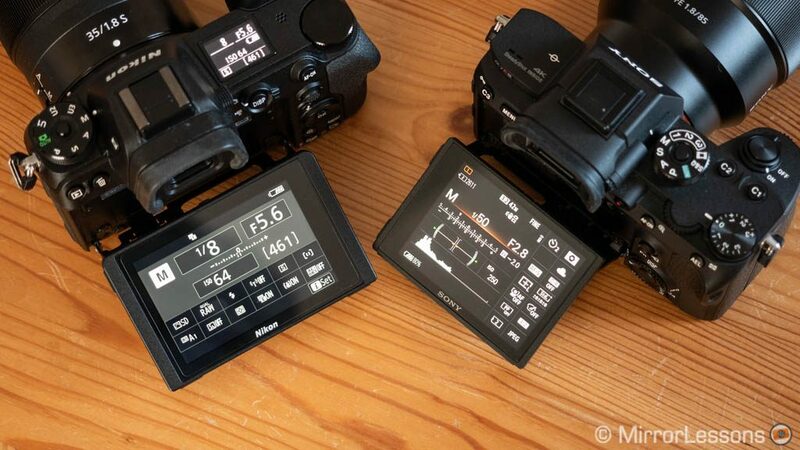 The menu system of each camera is quite different in terms of design and organisation. I remember the Nikon version from my old D700 and I was surprised to see that it hasn’t changed a lot over the years. 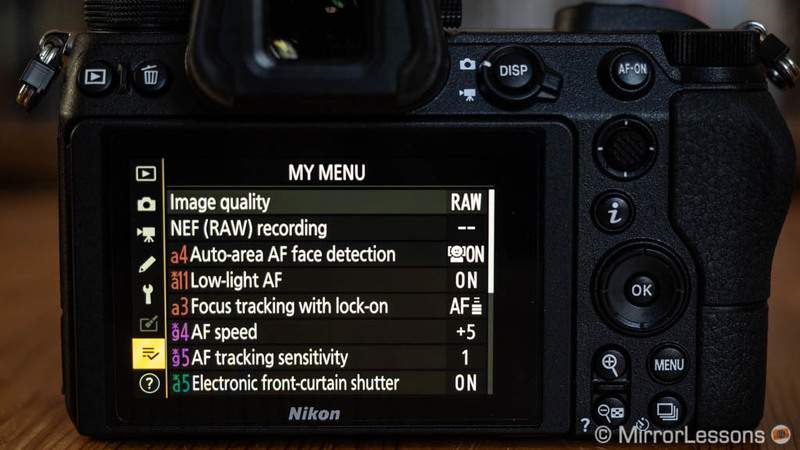 There are six main directories including a separate page for video, custom settings subdivided in 7 categories with different colours (autofocus, metering etc. ), and even one to retouch images or develop RAW files in camera. 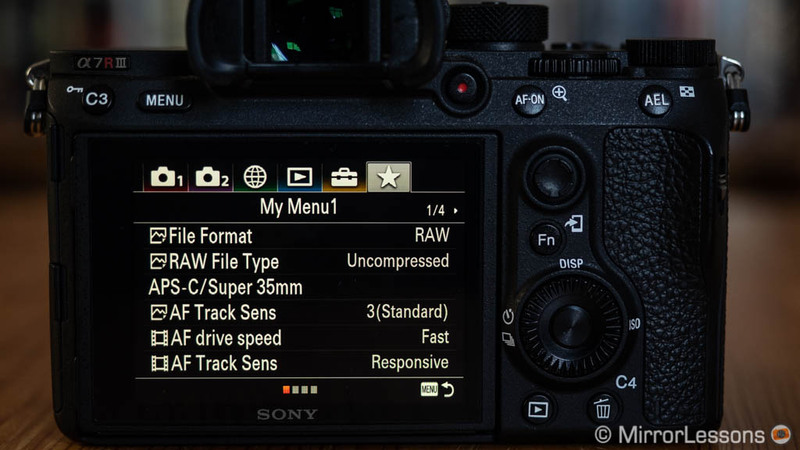 The A7R III menu is a bit more confusing and time-consuming to learn. Both cameras offer a My Menu option where you can shortcut your most used settings and it’s definitely very useful to have. 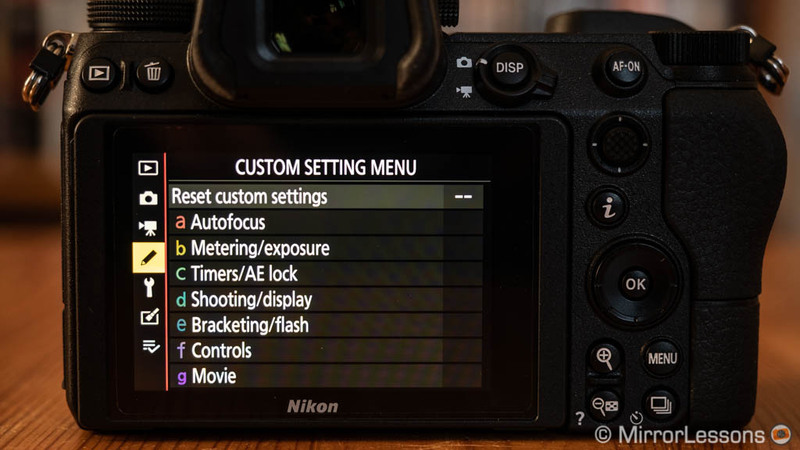 There is also a quick menu (i Menu on the Z7, Function Menu on the A7R III) with 12 slots that can be edited (31 options for the Nikon, 49 on the Sony). They can be configured separately for video. Each camera features three custom modes (called User Settings on the Z7) where you can save your favourite parameters for a specific genre like sports or wildlife, and activate all of them at once with the main dial on top. 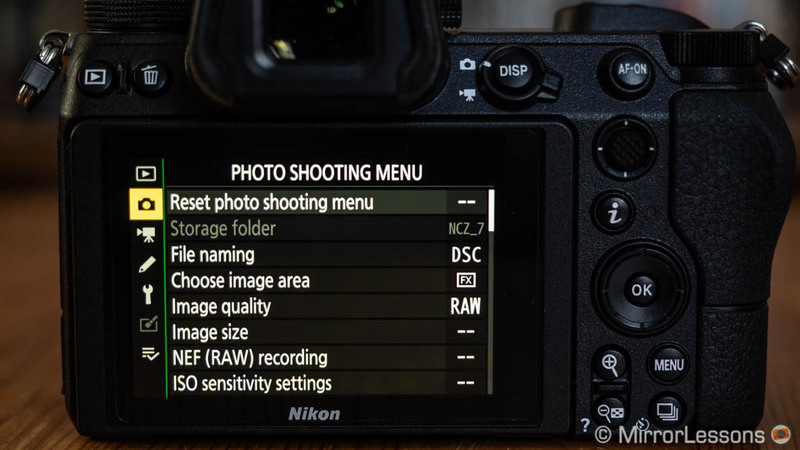 The Z7 also allows you to back up all your settings and customisations to the memory card, which is useful if you need to reset the camera or want to transfer them to a second body. One final thought in favour of the Z7 is that the software seems a little faster, more precise and more reactive overall. With the Sony I often end up scrolling beyond the value I want, which is probably also due to the free-moving controls such as the rear wheel. 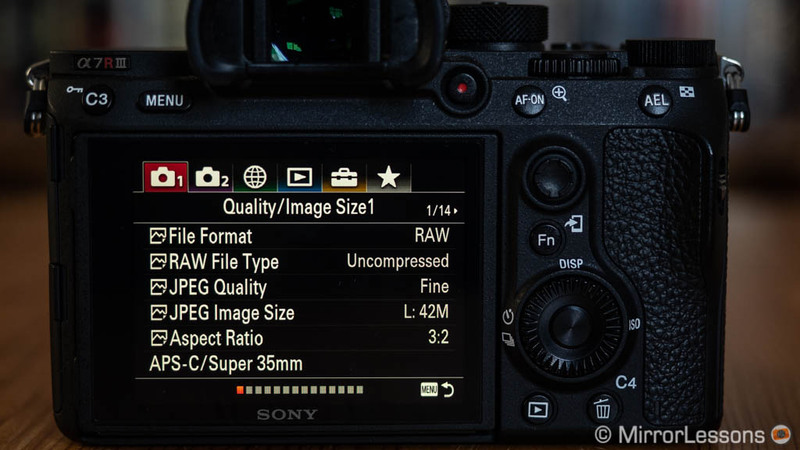 The start-up time of the A7R III can also be slower, especially when you turn it on for the first time after a night’s rest. The Z7 and A7R III use an electronic viewfinder with a 0.5in OLED panel and 3.6 million dots of resolution. 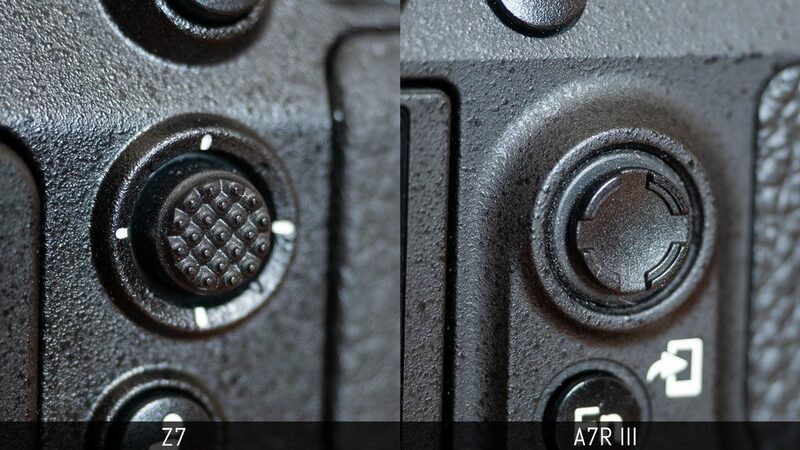 The Nikon has a higher magnification of 0.8x versus 0.78x on the Sony. 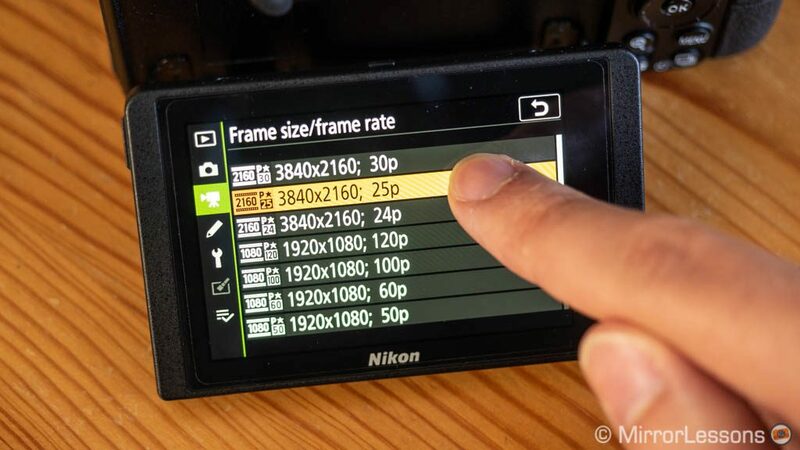 The latter has a longer eye point (23mm vs 21mm on the Z7) and the refresh rate can go as high as 100fps (PAL) or 120fps (NTSC), whereas the Nikon is fixed at 60fps. For real world use, I’ve grown quite fond of the Z7 viewfinder. The higher magnification coupled with the slightly shorter eye point makes the screen look bigger than the Sony’s, and despite wearing glasses, only the very edges of the four corners are cut off which is not a big deal. The rear LCD screen can be tilted up or down on both cameras. The Z7 version is larger and has more resolution (3.2 vs 3.0 inches, 2.10 vs 1.44 million dots). 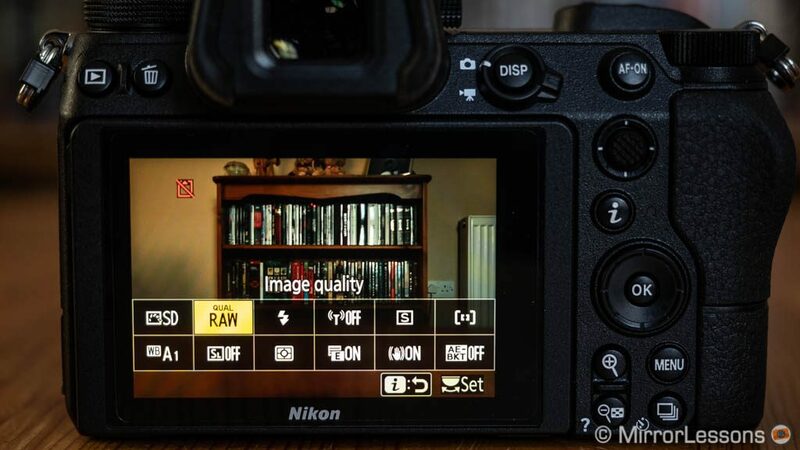 They are clear and bright but the details are definitely smoother on the Nikon screen when browsing through the menu or manual focusing. Both LCDs and EVFs provide enough detail and sharpness to manually focus with ease, with or without magnification. However in video mode, the resolution of the Sony LCD and EVF drops and manual focus becomes a challenge even with the magnification assist. 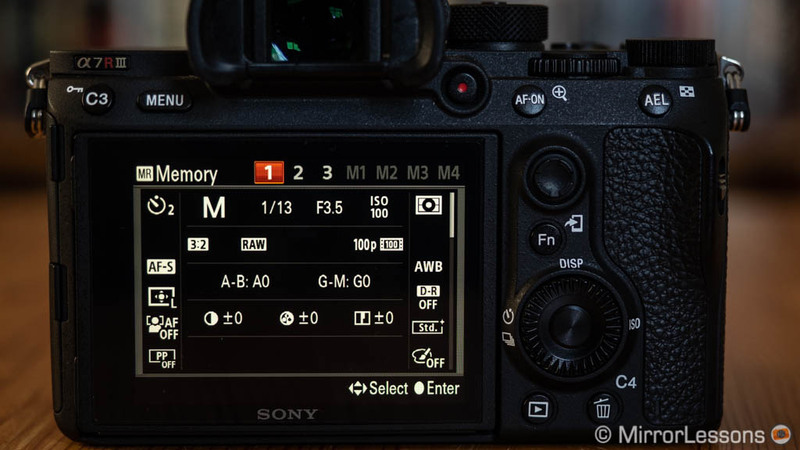 The A7R III has a mode called “Sunny Weather” which boosts the brightness of the LCD screen and can be of use when working in outdoor locations. However keep in mind that the colours are less accurate. The Z7 doesn’t have a similar mode but it remains more than decent if you boost the brightness up to +5. Another advantage of the Nikon camera is touch sensitivity. 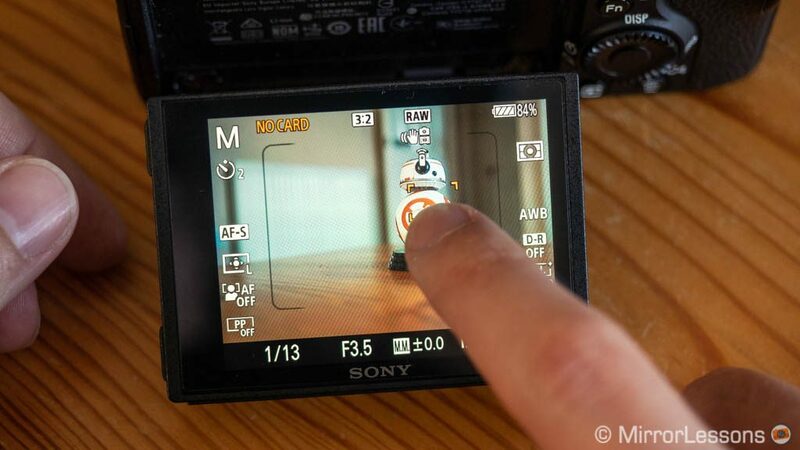 On the Sony it is limited to moving the focus point and swiping though your images in playback mode. On the Z7 you can do everything, including navigating the menu which is fast, precise and reactive. It’s definitely one of the best touch screen monitors I’ve used on a mirrorless camera. One thing that only the Sony allows is the use of the touch screen as an AF pad when looking through the EVF. It can be a good alternative to the AF Joystick and it works quite well. 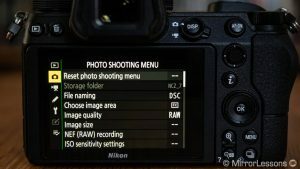 Finally we have the top OLED panel on the Nikon Z7 which displays the settings in use, the remaining battery life and other things. It is small but does the job well and while not essential, it’s a very handy to have.